Our quarterly Adopt-A-Road was a success today. One team worked their way along Indian River Road picking up the trash to make our community look better and to keep this litter from being washed down the storm drains and into the river. Sadly, they collected 14 bags of trash, most of it discarded by passing cars - beverage cans, cups, bags, scraps of paper, and way too many cigarette butts. Cigarette butts are not biodegradable; the filters are a type of plastic that takes up to 10 years to fall apart, but even then the polymers persist in the environment. Please don't throw your butts out the window, but dispose of them properly. While the first team made progress on the cleanup, a second team worked on the new gardens at the bridge corners. Our gardeners planted Black-Eyed Susans at each bridge corner, spread mulch, and did more weeding. The Black-Eyed Susans, a showy native, should bloom through the summer. As you pass over the bridge, ease off the gas pedal and take a glance as our gardens grow. Our next group cleanup will is tentatively scheduled for Saturday, September 14. We look forward to having more volunteers help to spruce up the neighborhood. There has been great progress on our plans for establishing a nature trail in Indian River Park. We've been consulting with the Eastern Virginia Mountain Bike Association - Southside on trail alignment and back in April we submitted a formal proposal to the City of Chesapeake Parks and Recreation Department. 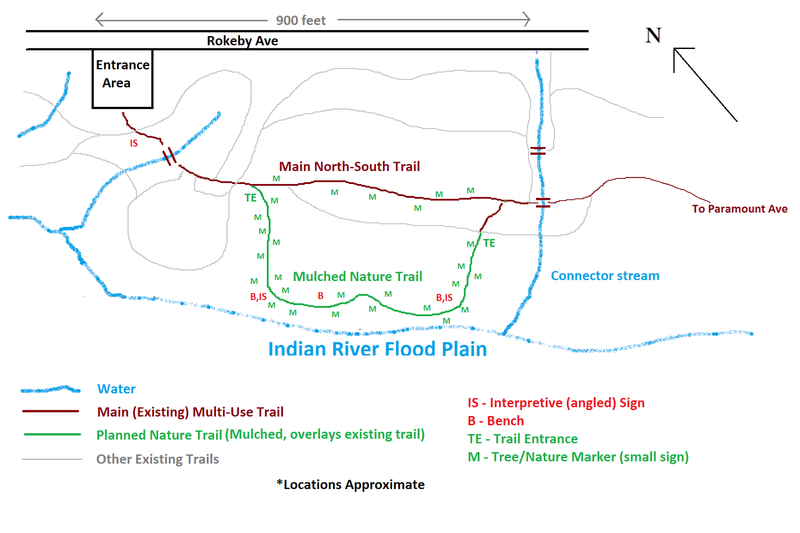 The proposal was well received and now the Parks and Recreation Department is looking to allocate funds from their Open Space budget for improvements to the park entrance area at Rokeby Ave. and Main St.
Our plans include converting a section of trail along the riparian flood zone of the Indian River inside the park into a mulched nature trail, complete with tree identification markers, benches, and some interpretive signs. We are looking to the city to improve the entrance area by establishing an improved permeable surface parking area, adding picnic benches, an information kiosk, and bike rack. To this we would add a demonstration native plant and/or rain garden. We are also looking to improve the signage and pathways around the Paramount Ave. entrance by the power lines. We see this project providing improved access to natural open space for the community and a renewed interest by the city in the significance of the park. It will also provide a venue that can be used by scouts, school groups, and others to learn about native vegetation and the benefits of preserving a healthy and interconnected habitat for fish, birds, and other wildlife. Our goal is to establish the nature trail this year and have the entrance area improvements complete by the spring. We're going to need a lot of volunteers to help with building the trail and establishing the other features. Please contact us at info@friendsofindianriver.org if you are interested in participating or if you have any questions. Participating in the 25th Clean the Bay Day, the Friends of Indian River tackled the trails and river flood plain in Indian River Park today. We wish to give a big Thank You to the 14 volunteers that fanned out across the park. The team collected 18 bags of mostly bottles, cans and drink cups washed down river from the neighborhoods streets into the park. We also collected an assortment of odd items - a huge piece of carpeting, a refrigerator door, a fluorescent light tube, and chair cushions. Along the way we spotted or heard a variety of frogs, lizards, and birds along the stream. After the cleanup, the group sat down for a well-deserved picnic at playground. We also got an update on the plans to establish a nature trail in the park. The Parks Department has responded positively to our proposal and is working on funding to upgrade the Rokeby entrance to park; we'll be getting more details in the next week. We're tentatively setting our plans to get the trail signage and amenities installed this fall. We'll keep everyone informed as things progress. A big thank you to our trail team - Jayne, Ed, Carol, Linda, and Kenny - for working on the proposal and plans. Our next meeting is a Thursday, June 13th, 7 PM, at the Oaklette United Methodist Church. Mark Woodward of Chesapeake Planning Department will speak to us about the 2035 Comprehensive Plan. There will be light refreshments and door prizes after the presentation.